At its 1868 La Scala debut, Mefistofele was considered too ambitious, too pretentious and most of all, too long. Boito's libretto shuttles the audience from Heaven itself Faust's hometown of Wittenberg to high in the Harz Mountains, to an idyll straight out of classical antiquity, making for an exhausting experience. The opera is always heard today in its revised, stripped down version (from 1876) which brings its seven scenes (four acts plus prologue and epilogue) in at three and a half hours). With numerous pauses and scene changes in this classic Robert Carsen staging, Thursday night felt a lot longer. Carlo Rizzi's loving but sluggish conducting didn't help. Mefistofele opens with a Prologue in which our horned antihero finds himself in Heaven, confronted by offstage trumpets, delicate orchestral writing and a heavenly host singing the praises of their creator and employer. An enchanting children's choir played the cherubim, singing tricky, repeating phrases that lead the way into the big mass of choristers whose "Ave signor" sets the tone for the entire evening. It was huge, cosmic and stunning, with the Met orchestra toiling mightily in the pit to bring it to life. (Unaccountably, the cannon shot sounds that punctuate the chorus' bombast were missing.) Cannon or no, these singers were the biggest stars of the night. Against this, the devil entered. mincing in a long red tailcoat and a pair of dance shoes, a defiant figure against the order of things and yet part of them in the opera's cosmology.This sulfuric interloper was played by Christian Van Horn, a young bass from just up the Hudson River. He took on the challenging title role with a dark, grainy instrument and sharp, funny stage presence. 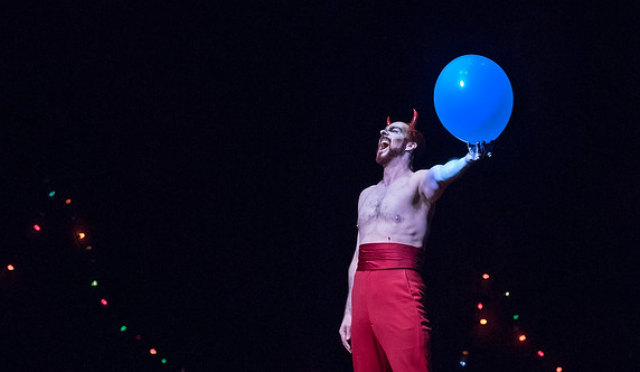 Van Horn proved capable of handling the Devil's arias, monologues and continuous asides to the audience with humor, wit and a gripping stage presence that never seemed affected. The only hitch came in the big aria "Ecco il mondo", delivered at the Walpurgisnacht celebration. It is the climax of the entire opera but here, it seemed a little anti-climactic. As Faust, tenor Michael Fabiano started well, bringing bright colors to his Act I entrance. The tenor breezed through the early pages, taking the lead in the big quartet scene where Faust seduces the peasant girl Margherita. He was starting to run out of steam after the second intermission and his encounter with his "ideal" woman, Helen of Troy. By the final aria, the voice was starting to fray, with an unwelcome, pinched sound, but he was able to finish, save his own soul and make his exit (carried off to heaven by the upraised arms of the chorus) without any disasters. Angela Meade sung the role of Margherita, a good choice as the bel canto specialist has begun to move into heavier repertory. However, she found herself in an unwelcome place in the prison scene, suffering a bad crack and pitch-shift at the start of the phrase. Hopefully she will have better results later in the run, but it was a worrisome moment. Jennifer Check did well with the mezzo part of Helen of Troy, continuing her reputation as a welcome utility singer who deserved to get better and bigger parts. The handsome Robert Carsen staging, first seen at in Geneva in 1988, is now over thirty years old. It has been tweaked and updated. Projected clouds have replaced the old, shifting wooden ones. The chorus, in white robes, hoods and crowns still forms an impressive sight, outdone only by the bright motley of the parade scene in the actual first act. The quartet seduction of Margherita is staged on and old-fashioned hand-cranked turntable, emphasizing the concept of a play within a play that permeates this entire show. The Classical tableau with Helen of Troy look hokey and old-fashioned but that only emphasized what the audience already knew: that all works of the Devil are illusions. (Reprinted with permission from Superconductor).